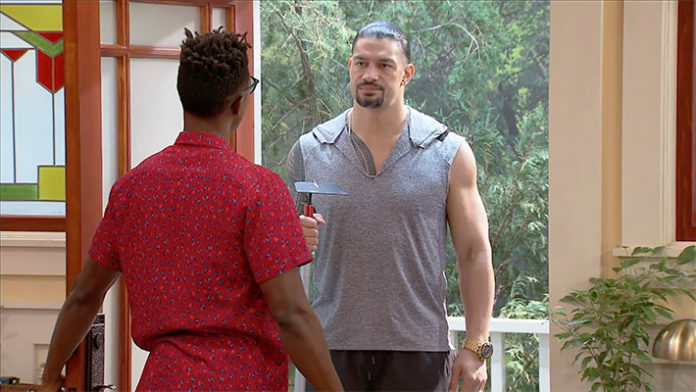 While away from the WWE, former WWE Champion Roman Reigns is making the transition at acting as he will make his return to television next month. However, it will not be under the WWE banner but rather on Nickelodeon as he’ll appear in a role as a guest star on Nick’s Cousins For Life show in an episode that will air on Saturday, March 2 at 8:30 p.m. ET. The episode is titled “A Farewell to Arthur?” and his character is described as a man named Rodney, who has his vegetable garden is dug up by a pet pig named Arthur. This isn’t the only acting gig that he has done in recent memory as he’ll appear in the Fast & Furious Presents: Hobbs & Shaw movie alongside Dwayne “The Rock” Johnson in order to play the brother of Johnson’s character. Reigns has not been seen on WWE programming since October 22nd during an episode of Monday Night RAW when he, unfortunately, announced that he was taking time off from active in-ring competition and drop the Universal Title in order to deal with a recurrence of leukemia.